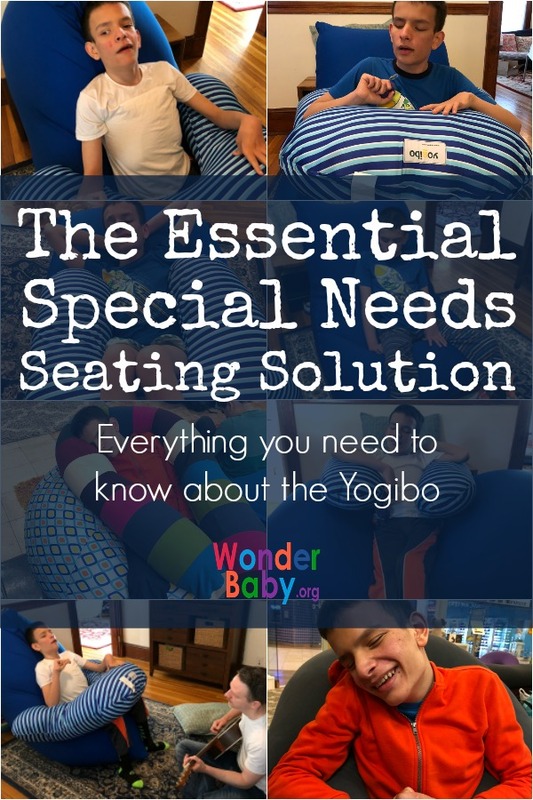 The Essential Special Needs Seating Solution. Everything you need to know about the Yogibo. I’ve heard people talk about it and I knew it was supposed to be really cool, but I never really looked into it. You know how that goes? When people tell you about a product or program that “would be great” for your special needs kid and you nod and say thank you then promptly move on to other things. Well, I finally went and checked out this thing called a Yogibo and I’m here to tell you that YOU NEED ONE OF THESE! They are amazing! Our problem finally became critical when Ivan started wearing a very large back brace for scoliosis. Suddenly finding comfortable, particularly recreational, seating was really difficult. I wanted Ivan to be in a seat that supported him without pressure points so that his back brace wouldn’t leave marks on his skin. 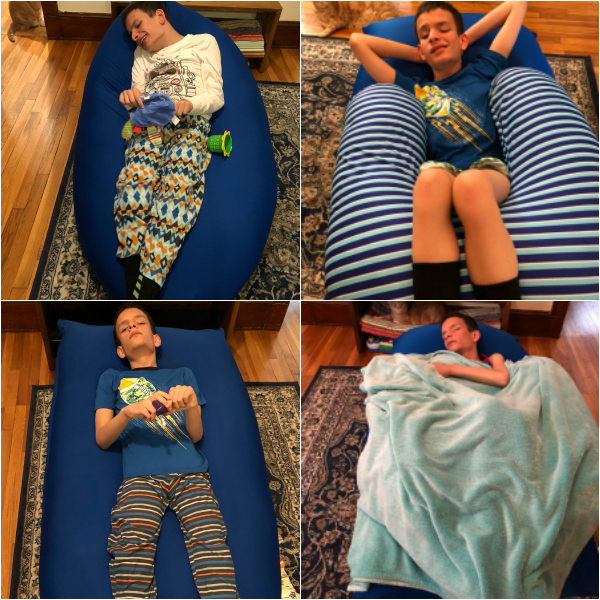 I wanted him to be able to sit with his feet on the floor (imagine being in a wheelchair all day, no vision, always hovering above the floor), but sitting on the floor in the back brace was no longer an option. 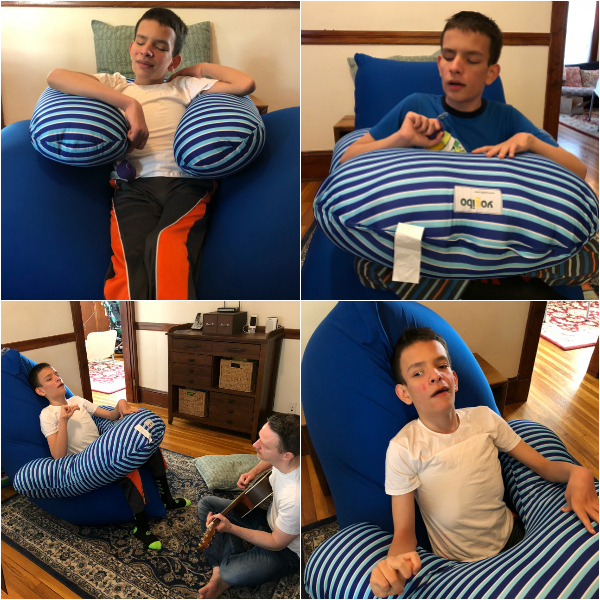 I wanted him to be able to recline when he was tired, but also have the option to sit up with support when he was ready to engage in activities. I also need him to be safe in case he has a seizure. Can one chair really do all those things? So we decided to try out the Yogibo in the store first (since it is kind of an expensive purchase) and we also went during one of their discount events. If you do decide to purchase a Yogibo I’d recommend following them on Facebook or signing up for their email alerts so you will know when they are offering discounts. Ivan loved sitting in the different Yogibo options and I was really impressed with all they had to offer. Soft squishy plush toys, weighted blankets, aromatherapy wraps… I kind of wanted to get one of everything! We’ve had our Yogibo for a couple weeks now and we’ve had a lot of fun learning all the different ways we can use it. We ended up buying the Yogibo Max with a Yogibo Support Pillow for added support when he needs it. I also really want to get a Yogibo Caterpillar and have it on Ivan’s birthday wish list (hint hint grandma). The Yogibo Max is six feet long but can be stretched out as much as seven and a half feet. The outside material is stretchy (very similar to a sensory body sock), washable and also comes in water resistant options. The inside material is squishy and moldable. Unlike a normal beanbag, the Yogibo can take many different shapes and holds itself up, making it supportive when it needs to be, but can also shape around your body, making it comforting too. There is nothing hard in the Yogibo, so no matter how you use it there is no pressure being placed on the body. It’s an amazing sensory experience and incredibly versatile too! The Yogibo isn’t really a toy, but it’s still fun to play with! If you have your own Yogibo, let us know how you’ve been using it!